Is the 19 year Metonic Cycle found in the works of ED Leedskalnin? I wondered what happened if you divide the 561 by 19 years in the Metonic Cycle and I got 29.526. This is extremely close to the official period of 29.53 days per 235 synodic months in the Metonic Cycle. What is the chance that the number of words in these 3 works is exactly 29 synodic months of 29.53 days off of the Metonic 19 year total of 6939.602 days? In other words.. now we simply need to find the missing 561 days location in EDL's works. Is it his punctuation marks in those 3 works? Is it hyphenated and apostrophe words? Is it numbers? Why 1 month per 19 years? Is it just a clue that we're on the right track and have to find the missing months? There is 6929 characters in Mineral, Vegetable and Animal Life. There is a difference of 10 from 6939. If you notice, the Magnetic Base Sound Base has just over this amount of characters as well at 7138 characters. There is a correlation here between the number of days in a 19 year Metonic Cycle and the number of characters in these 2 works..as well as the number of word in all 3 works.... which I already showed to be off by 561 or 19 synodic months. Notice that the Metonic Calendar is a merging of the Solar and Lunar calendars every 19 years. Now, the lunar calendar of the Hebrews was 354 days.. which is 11 days less than 365 day solar year. So, that means there is 19 x 11 days difference between the solar and lunar calendars every year. Look at EDL's numbers. We have 198 more characters than 6940 in MVA and 11 less days than 6940 characters in MVA. If you divide 198 by 11 you get exactly 18. This represents the difference in days between the solar and lunar calendars in 1 metonic cycle... 11 days every year. But there is right at 0.25 days difference.. as a Solar year is actually 365.25 days roughly. This means you multiply 0.25 days per year times 19 years and you get 4.75 days in 19 years. Perhaps this is what is represented by the 2 question marks in each of the 3 works. I am not sure of this yet. 1+2+3+4+5.. to 49. Then the 50th is special. It just so happens when you do this to 49 you get 1225. Notice this is the number of extra words in Magnetic Current "booklet" or "pamphlet" more than his "8000 words pamphlet". He has 9225 words. Could the 1225 words that contain a U or J or misspelled be representing the days of the OMER? Once again.. the same theme of a cohesive message that I'm finding EVERYWHERE in EDL's works and in the Torah.. the relationship of the Semi-Circle arc to the diameter. The punctuation marks of the 3 works that add up to 395.. have 126 of them in MBSB.. The 73 and 126 are in the square root of 3 relationship... which is associated with the Vesica Pisces of 2 intersecting circles. In other words.. half of 126 is 63.. the radius of a circle.. and if you have two of those same circles overlap and touch at the centers.. then the height of the vesica pisces intersection would be 73 in each direction from the center. 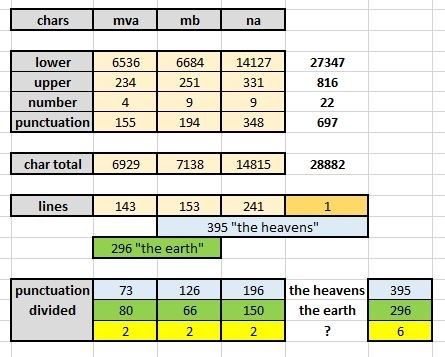 The half circles would all equal 395 or "the heavens". You see the sacred geometry in EDL's numbers in his works everywhere.